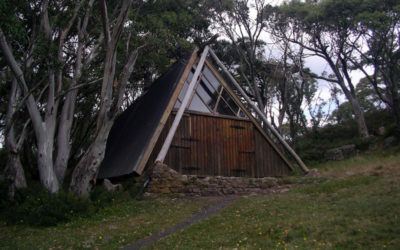 The Buller Huts Trail is a serious grade 5 undertaking for well–prepared, self-reliant adventurers, with a good level of fitness and who understand the risks of walking in a remote alpine area. Weather can change rapidly, even in summer, when people have been caught under-prepared in cold, wet and windy weather. This is a trek not to be taken lightly. The Buller Huts Trail is a self-guided adventure for self-reliant and independent outdoor enthusiasts with a passion for remote wilderness. There are no official guided tour offerings at this stage, but watch this space as they may be available in the future. Will this be a solo or group hike? Research your trip using a current map and advice from experience walkers and local authorities. Emergency response / rescue can take time always have an emergency plan factored into your trip. Know how to access local emergency response via phone and/or radio. Leave a hard copy of your plan in your vehicle and with a reliable contact person. Fill out trip intentions books at the start of trips and in huts if available. Submit your trip intentions by downloading and completing this form. If you own a PLB ensure that is is registered and on every remote trip register your intentions here. Consider what navigation skills may be required?. What are the forecast weather conditions? Always check a current weather report but do not rely on it, plan for worst-case scenario by carrying extra food, water, clothing and equipment. Consider aborting your trip if dangerous weather is forecast. This could include conditions like heatwaves, fires, floods, extreme winds or extreme cold. What equipment should you take? Always carry maps and a compass, and know how to use them for navigation. GPS and mobile phones can help but they do not replace experience. Clubs can be a good way to advance your experience and knowledge. Carry more water than you’ll need, plan for emergencies. As with water carry sufficient food for the trip and pack extra in case of emergencies. Dress for conditions, bring extra and have wet weather clothing available. Always have enough to cover you for the worst-case scenario. Weather conditions in wilderness environments are sometime unpredictable. You should always plan for the unplanned. Always leave trip intention forms with someone who can raise the alarm if you do not make it back in time. Always pack extra food, water and clothes for inclement conditions. You never know when the weather might change. While this list is not conclusive I hope it gives you the general idea that planning is the single most important aspect of anything you do. 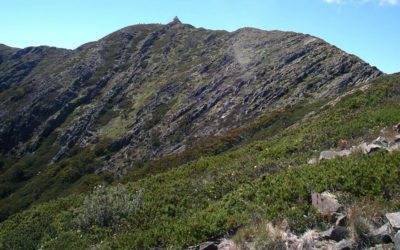 I have started and ended this circuit trek in the Buller Alpine Resort. The reasons for this are primarily for vehicle access as during most seasons it is easy to drive any vehicle to the start point. There are a number of access points along the trail but most, if not all, of these are only accessible via 4WD. The alternate entry/exit point are as follows. Please refer to the corresponding numbers on the route overview. The Ten Essentials are survival items that hiking and Scouting organisations recommend for safe travel in the bush. The Ten Essentials first appeared in print in the third edition of Mountaineering Freedom of the Hills Mountaineers (January 1974). 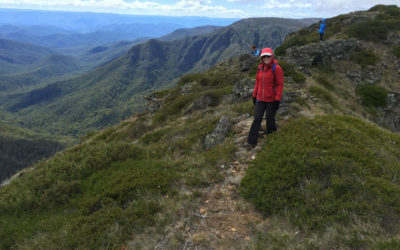 Many regional organisations and authors recommend that hikers, backpackers, and climbers rigorously ensure they have the ten essentials with them. However, personal preferences and differences in conditions may dictate otherwise and with experience most adventurers add and subtract from the list depending on the situation. Some lightweight hikers do not always carry all of the items and believe it is an acceptable risk they take in order to travel light and fast. According to the eighth edition of Mountaineering: The Freedom of the Hills book there are ten essentials, which are now referred to as the “classic” essentials. While still valid and widely used they do not reflect modern outdoor sports and all of the new gadgets that now are common. In 2003, the essential list was revised as part of the seventh edition of Mountaineering: The Freedom of the Hills to keep up with modern equipment. The current edition, 8th edition continues with the new essentials list with no major revisions. The new list takes a “systems” or functional approach. Navigation. Topographic map and assorted maps in waterproof container plus a magnetic compass, optional altimeter or GPS. Sun protection. Sunglasses, sunscreen for lips and skin, hat, clothing for sun protection. Insulation. Hat, gloves, jacket, extra clothing for coldest possible weather during current season. Illumination. Headlamp, flashlight, batteries. LED bulb is preferred to extend battery life. First-aid supplies, plus insect repellent. Fire. Butane lighter, matches in waterproof container. Repair kit and tools. Knives, multi-tool, scissors, pliers, screwdriver, trowel/shovel, duct tape, cable ties. Nutrition. Add extra food for one additional day (for emergency). Dry food is preferred to save weight and usually needs water. Hydration. Add extra 2 liters of water for one additional day (for emergency). Emergency shelter. Tarp, bivouac sack, space blanket, plastic tube tent, jumbo trash bags, insulated sleeping pad. Signaling devices, such as a whistle, mobile phone, two-way radio, satellite phone, unbreakable signal mirror or flare, laser pointer. Some experts recommend having duplicates of the Essentials in different sized kits: in pockets, on key rings, in pocket kits, belt pouches, belt packs, day packs, and backpacks. So how long does it to get from point A to point B? On any hike it is vitally important that you know how far the trail is and how long you anticipate the hike to take. Time and Distance Planning is particularly relevant when hiking with other people and over varied terrain. Correct Time and Distance Planning involves having a good understanding of the different types of terrain and vegetation cover that will be traversed and the probable speed of the group. Use the Naismith Law to estimate the time required for your hike. According to this law, a fit adult can cover 5 km of level ground per hour, and an extra hour should be added for every 600 m of uphill hiking. Plan to end your hike two hours before sunset. Select a gentle slope to go uphill. Avoid challenging yourself with a very steep or treacherous route right at the beginning. The party’s entire load should be distributed among all members of the group, taking into account the strength of each member. Is the group fit and fast or tired and slow? Consider the pace and energy level of the average walker – high energy after breakfast, slowing down to lunch, slight increase after lunch but getting gradually tired and slower late in the afternoon (especially after climbing up hill all afternoon). What packs are they carrying – light day packs or heavy overnight packs? A guide as to how fast a group of average hikers (say 6) with overnight packs can travel. To determine the expected time taken, divide the estimated distance travelled by the guesstimated pace of the group. Add up the times for each section of the hike, allow for rest periods (5 minutes/hr), tea breaks (additional 5 minutes every 2 hrs) to give a cumulative time for how long the walk is expected to take. Experience will fine-tune your guesstimating skills. There are no hard and fast rules when it comes to taking a break on the trail. Some hikers prefer regular breaks (such as every half hour) while others call for a break before or after a tough section of the trail, or in a cool, shady, or scenic spot. My suggestion is to allow for short rest periods of five minutes every hour. Leave your pack on so that your muscles don’t cool down as this makes it harder to get started again. For lunch or tea breaks I would stop for a maximum of 15-20 minutes. Never eat or drink while moving. Relax to take refreshments. Don’t hurry your food or drink. Finally, remember that most hikes are not races (unless you are on one of my hikes). Get wet to cool off if you’re getting hot. Unwind. Relax and take the time to observe and appreciate the natural beauty around you. Learn to look for the birds, plants and animals. They also need water and food to survive. Your observations may one day save your life. The Leave No Trace copyrighted Seven Principles, trademarked logo, associated artwork and texts are the property of the Leave No Trace Center for Outdoor Ethics. With permission from the Leave No Trace Center for Outdoor Ethics and under specific circumstances, the organization extends use of its logos and texts. All hikers should be armed with sufficient knowledge to avoid encountering unnecessary problems in the bush. Before adventuring off the beaten track, it is important to ensure you are well prepared with a hike safety plan and are carrying the correct safety equipment for all possible emergency situations. We all need to consider hike safety and plan in advance a suitable route, clothing, equipment and food for our hiking party. Planning also ensures that we are aware of the skills of the group, potential difficulties or hazards and the accepted courses of action if and when problems arise. The following links aim to provide important information to ensure you and your hiking party return safely from every hike. Please feel free to comment and offer your own suggestions so that we can all be safer out there. Undertaking this trek will be a challenging yet rewarding experience. Why not take a little extra time, before and after the trek, to reward yourself by dining and staying in the Mansfield-Mt Buller region. Indulge in the local food, wine and beer, explore historic towns and villages and soak up the local vibe that is an eclectic mix of creative art, music and tales borne of the mountains. 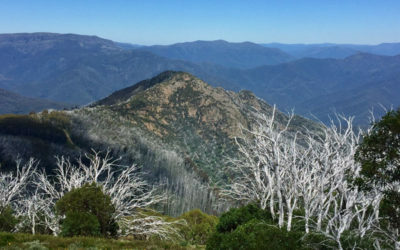 The Mansfield, Mount Buller region offers a range of accommodation options including self-contained houses, apartments, comfortable lodges, farm-stays, caravan parks and hotels, motels, resorts and retreats. Visit the accommodation section of the Mansfield-Mt Buller website for details, booking information and pricing. Love This? Share It With Others! Looks fabulous and I hope to do this Trail in 2018. Do we have to book campsites? Is there a fee to do the walk? National Park fee? Thanks for your amazing efforts. In answer to your questions though. As this is a self-guided trek the only expenses you will incur are your costs to get to and from the trail-head, your food, gear and any food and/or water drops that you decide to prepare. There are no costs for campsites, no fees payable to undertake this trek and no National Park entry fees to pay. Yay, pretty much free. This looks so great and I’m looking forward to working up to it and giving it a go. Water procurement looks to be the biggest problem. In light of that, what season/month would you recommend going? Late spring? In answer to this one, as far as the seasons are concerned, that all depends on your sense of adventure and experience. For 99% of people I would recommend that late spring or autumn are the best seasons to undertake this trek. That will ensure milder weather and will offer a greater chance of procuring water along the route.